On Sunday, December 9, from 11 a.m. to 2 p.m., more than 200 White Castle locations will offer free kids meals for up to four tiny humans per adult human. That’s a good damn deal. The only cost is this: You must subject your children to a visit with a big stranger in a weird red outfit and a beard—probably a fake one. 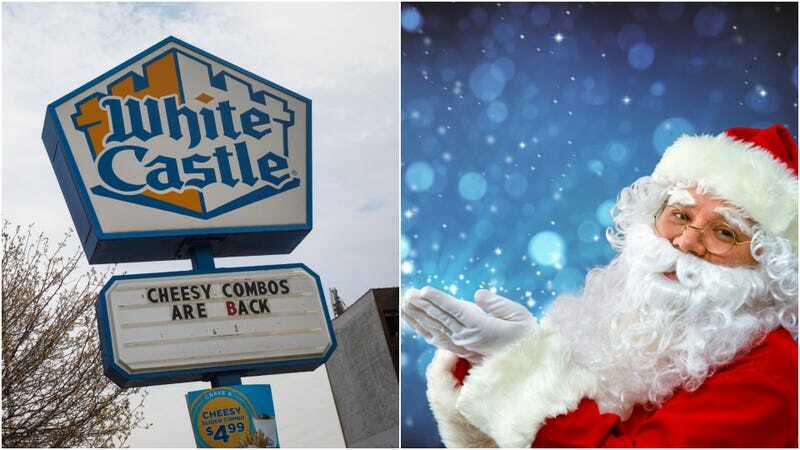 White Castle will host a Lunch With Santa for the seventh consecutive year, welcoming many tiny humans (and their full-size humans) to locations throughout the country for “a free, fun, casual way to celebrate this special time of the year.” And again, all you have to do for the free food is convince your kids that the large adult in the fuzzy, cheese-smelling outfit is a-okay, and that they should tell him what gifts they’d like, so that they can later learn a valuable lesson about expectations and disappointment. No reservations are required, and should the large adults wish to document the nightmare as it unfolds, cameras are encouraged.